So you want someone to celebrate festivals with, and to learn from and bounce ideas off. Personally I love having a magical group, because it gives me the opportunity to do ritual with other people, to exchange ideas, and to have conversations about stuff that never normally gets talked about, and to experience those moments when all the energies of the group flow together and become more than the sum of their parts. Groups can be awesome if you find the right people to celebrate with; they can also be a bit dysfunctional. The trick is to go about finding a group with your eyes open. If you experience warning signs and feel that the group you are considering joining does not fit your needs, proceed with caution. Finding the right group for your needs can be really tricky. Most people are either incredibly cautious about approaching groups, or touchingly enthusiastic and hence vulnerable. 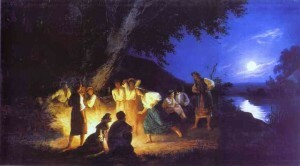 “Night on the Eve of Ivan Kupala” by Henryk Siemiradzki. Licensed under Public Domain via Wikimedia Commons. It is all too tempting to assume that the group you have found was somehow meant for you, and to ignore the warning signs – but sometimes that is not the way life works, and it is just a really excellent idea to run a mile. If the group you are considering joining tries to tell you that they are the One True Way and that all the other groups have it wrong – run away. Even if the group doesn’t exhibit the classic warning signs, but their approach and philosophy is just not a good fit with yours, then maybe they are not the right group for you, and you are not the right new member for them. I often come across people who say that they don’t want to join a group for various reasons. Some of them have had a bad experience of being in a group that has put them off. That’s understandable, but not every group is the same. I had a couple of bad experiences, but that didn’t put me off groups completely – it just made me more cautious. Others say that they need to do more work on themselves before joining a group. My answer to that one would be that a group is a great place to work on yourself, because social interaction with others is where personal change and growth usually happens. Another reason for not wanting to join a group that I have come across is being an introvert. That seems like a valid reason. But joining a group doesn’t necessarily mean you have to reveal your deepest secrets or spend vast amounts of time with others; it does mean engaging with them on a quest for meaning and connection. When you are approaching a group, ask lots of questions. Does the group have ground rules? Do they expect you to copy out rituals by hand? What is their attitude to disagreement – theological or magical or political? Are they prepared to learn from other people? How do they feel about members being involved with other traditions? Do they value previous experience? Do they value creativity and extemporisation, or do they prefer more formal rituals? Can you meet the existing members? Is there a training process prior to initiation? Can you attend an open ritual before deciding whether to embark on the training? Do they have initiations? How far into the training do these happen? You should also ask yourself a similar set of questions. Do you want a group that has ground-rules? How far are you prepared to travel for meetings? How many meetings per year are you willing to commit to? Do you want to copy out rituals by hand? How do you feel about people with different opinions from yours? Are you prepared to be challenged in your thinking? Do you have the time and energy to be involved with more than one tradition? What skills and experiences can you bring to the group? What style of ritual do you prefer? Are you prepared to put in the effort of engaging with the training process and learning new things? Are you comfortable with the idea of working skyclad? Are you comfortable with the idea of initiation? The answers to these questions will vary from one individual to another, and from one group to another. Hopefully, you can find a group whose answers to the questions are a fairly close match with your answers. Phil Hine (1998), Approaching groups. An excellent article with a really good set of guidelines and a list of warning signals for dodgy groups. Patti Wiginton, Warning Signs in Prospective Covens – excellent checklist of warning signs of dodgy groups, and groups that may be OK, but just not a good fit for you personally. Patti Wiginton, Should I Join a Coven I Found Online? – points out that you should follow all the same guidelines for meeting prospective groups that you found online that you should follow for internet dating. Patti Wiginton, Are you an older newbie Pagan? – for people who are new to Paganism but feel as if all the other Pagans their age are very experienced. This post is part of a series, Paganism for Beginners. All the posts in this series will appear in the category ‘A Beginner’s Guide‘. You can find them by clicking on the ‘FILED UNDER’ link at the foot of the blogpost.